Sri Krishna is the central figure of the Bhagavad Gita. Sri Krishna is widely considered by Hindus to be an Avatar – a direct descent of God. During the Battle of Kurukshetra, Krishna gave Arjuna the immortal spiritual discourse of the Bhagavad Gita – Krishna taught a spiritual path of wisdom, devotion, and discrimination. Sri Krishna also popularised devotional bhakti yoga through his time with Radha and the Gopis in Vrindavan. Krishna was born in prison to devout parents – Devaki and Vasudeva. At the time of his birth, his life was in danger because the tyrant Kamsa was seeking to kill him. It had been foretold that Kamsa would be killed by Devaki’s eighth child. Since Sri Krishna was the eighth child, he was smuggled out of prison to be raised by his foster parents Nanda and Yasoda in Gokula. Nanda lived a simple lifestyle and was a chief in the local Cow-herding community. The young Sri Krishna is often depicted in these days as being a mischievous child, who enjoyed playing pranks and having fun. Some worship Sri Krishna as the ideal child of innocence. However, even in his young years, Krishna is reported to have killed demons Trinavarta and Putana. He is also said to have lifted a nearby hill – Govardhana to protect the villagers against the wrath of Indra. In the early stage of his life, Sri Krishna is also often depicted playing the flute for his beloved gopis – female devotees. Of these Radha was the greatest devotee. On his return to Mathura, Sri Krishna killed his uncle Kansa – after Kansa had tried several times to have Krishna killed. In Mathura, he befriended the Pandava Prince Arjuna. Sri Krishna became a counsel and friend to Arjuna. The Kurukshetra war was a battle between the Pandavas and Kauravas (led by King Dhritarashtra). Despite the provocations of the Kauravas, Sri Krishna tried to mediate to avoid a conflict. He asked the Kauravas to give the Pandavas just a small amount of land. However, Dhritarashtra refused any compromise. Once war became inevitable, Sri Krishna offered a choice to his dearest friend Arjuna – either he could choose Sri Krishna himself, or he could choose Krishna’s armies. Arjuna chose the counsel of Sri Krishna rather than his armies. It was on the battlefield of Kurukshetra that Sri Krishna gave the immortal dialogue of the Bhagavad Gita, which was an exposition of Sri Krishna’s yoga and how an aspiring seeker might seek union with God. Unlike Indian scriptures of the past, the Bhagavad Gita did not require world renunciation but encouraged world acceptance. The Bhagavad Gita and the life of Sri Krishna were very important for making spirituality accessible to ordinary people – and not just yogi’s who renounced the world. The central message of Sri Krishna was for man to take part in desireless action – motivated not by human ego, but for the Divine Cause. During the battle, Sri Krishna occasionally intervened to help Arjuna and the Pandavas win. Sri Krishna broke his own word – proving his love for his dearest disciple was greater than so-called human morality. Sri Krishna also unveiled his universal form to Arjuna – showing Arjuna his full spiritual Realisation. After this Arjuna became a disciple of Sri Krishna, rather than just admirer and friend. Sri Krishna embodied both the human and divine aspects. As an avatar, he played a human role, but, at the same time, was a fully realized soul – one with God. During his lifetime, few recognized Sri Krishna’s spiritual height. Sri Krishna took eight principal wives and had many sons. However, his sons were unspiritual and became increasingly haughty and arrogant. It is also said, Sri Krishna took 16,100 more women whom he had rescued from Narakasura’s Palace after killing Narakasura. It illustrates Sri Krishna’s compassion for the downtrodden and unfortunate victims of society and old social traditions. After the Battle of Kurukshetra, Krishna visited Gandhari to offer his condolences (Gandhari, wife of Dhritarashtra, had lost 100 sons in the battle) Gandhari cursed Sri Krishna because she believed he could have stopped the fighting. Gandhari cursed that Krishna would die within 36 years, along with anyone from the Yadu dynasty. Sri Krishna was happy to accept this curse because his sons had become badly behaved and he knew his mission was drawing to a close. 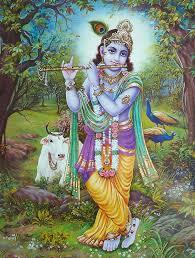 In later life, Sri Krishna retired to Dwarka where he lived for many years. Legend has it that Sri Krishna was killed by an arrow through his ankle when he was shot by a hunter, who mistook Sri Krishna for a deer. The ankle was the one area of weakness in Sri Krishna’s body. He accepted death calmly, knowing his time on earth and come to an end.